It was a cold, but good night of sleep. I started off with my gloves and beanie on as I dipped into a shaded valley some before climbing up a bit. I had a route decision to make today. There were two possible variants recommended over the general GR5 that went into a valley. I couldn’t take both, so I had to choose one over the other. 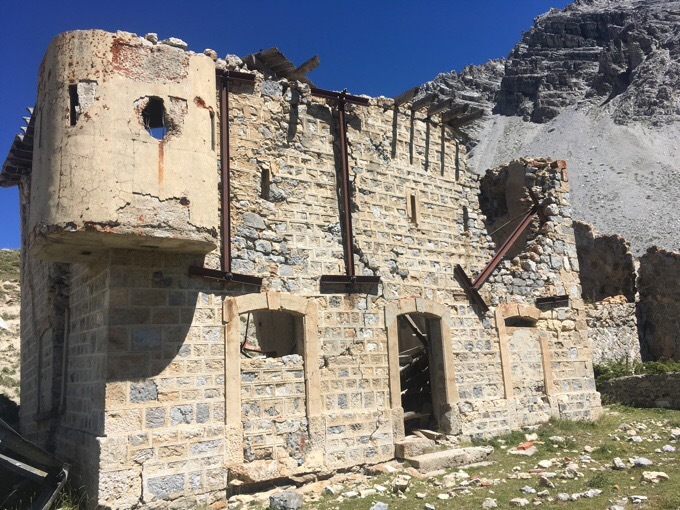 The one I chose (GR5B) added a couple hours of hiking, but went higher, into Italy a bit, and passed some WWI bunkers and buildings. 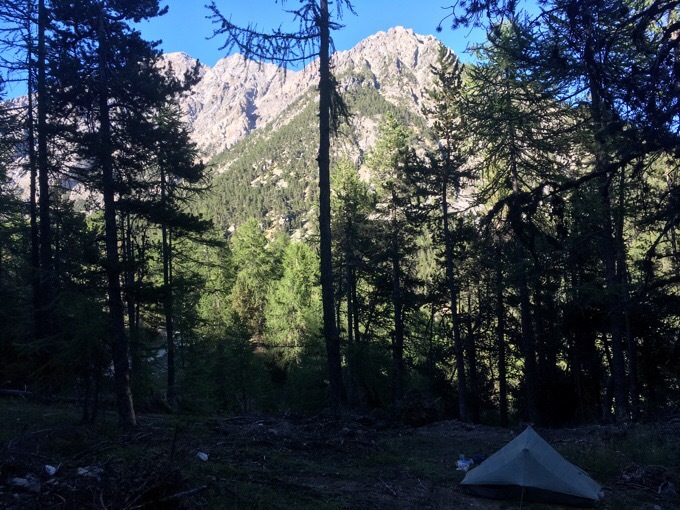 The one I didn’t choose (GR5C) didn’t add time, but parallels the route into the next major town and tries to give views. From what I read, it only has views for the first few hours and then the rest is back in the valley, so I went with the GR5B. I get frustrated with all the comparing and reading and calculating sometimes with the options, but that’s me, and I don’t like having to plan things. I want someone to make those decisions and I just execute the plan laid out for me. Hey, that’s one reason why I love substitute teaching. No planning! Just execute what’s already planned out. I was happy with my choice. 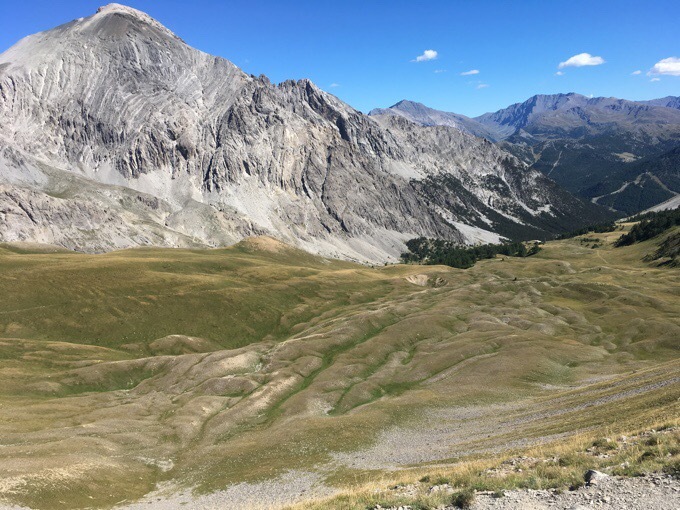 The morning was on the GR5B, which first went down into a valley and then climbed up to nice views. The landscape was much different and more rocky. This must be a popular day hike because tons of groups were on the trail. All were much older. I’m guessing that’s because it had a lot of WWI bunkers and buildings. That was just surreal to see. I walked into one of the bunkers. It was cold and echoed. 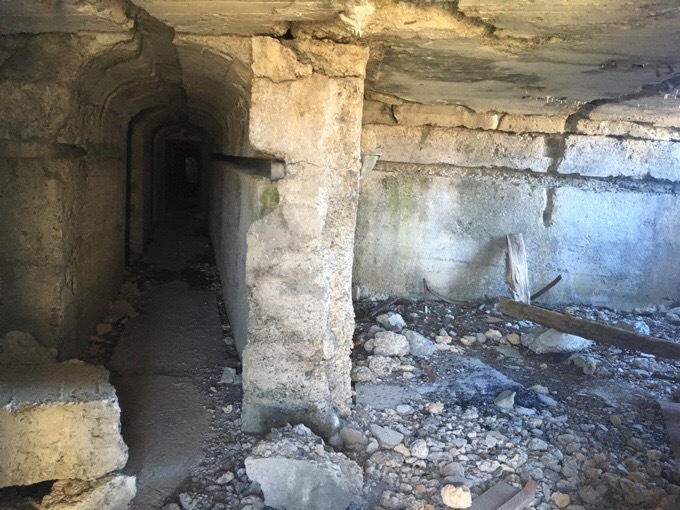 There was a long concrete tunnel that seemed to lead to the other side, but I got too freaked out to walk all the way through it. There were little indented spaces like tiny rooms along the tunnel too. I got creeped out quick! As I was walking, the trail turned into Italy for a bit. My first time in Italy! 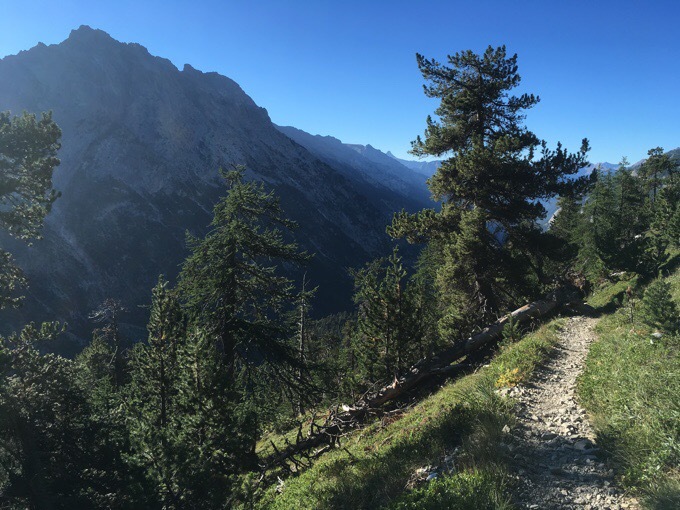 I could see down to the town of Bardoneccia, Italy for quite awhile as the trail followed the cirque around the town. I was surprised I didn’t have service to post yesterday’s blog all morning. Then, just before lunch, I got enough bars and plopped down for 40mins to get stuff done. I’ve been spoiled having service in my tent and it does interrupt the day to have to stop wherever the service is. 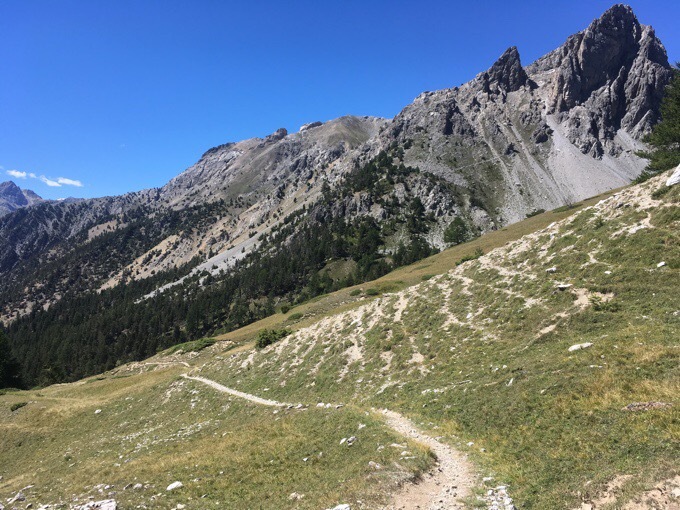 While I was doing that, all 40+ people I’d waded through walked by…I had to hike back through them when I finished and needed to go a bit further to my lunch destination. They were nice and understanding about it. Even though most didn’t speak English, we built up a bit of rapport after seeing each other three times along the trail. 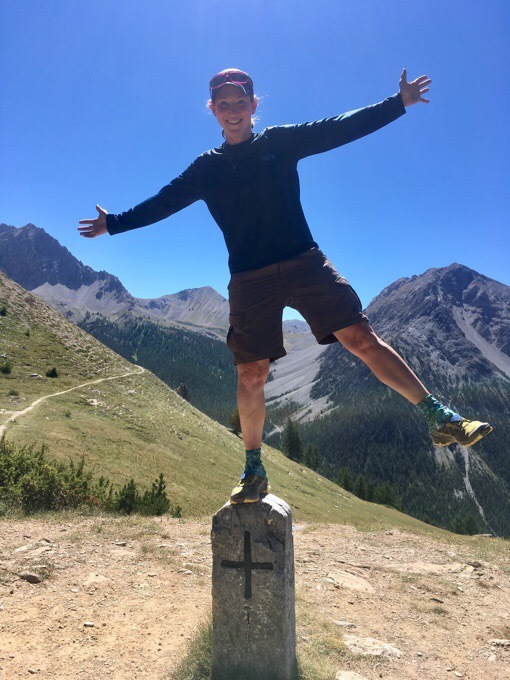 At lunch at Col de Pertusa, I was able to get a photo on one of the border markers. It’s tough to see, but there’s a capital I at the bottom under the big plus symbol. The other side had the F and the floral symbol, which I do associate with France. Not sure what the plus sign is for. 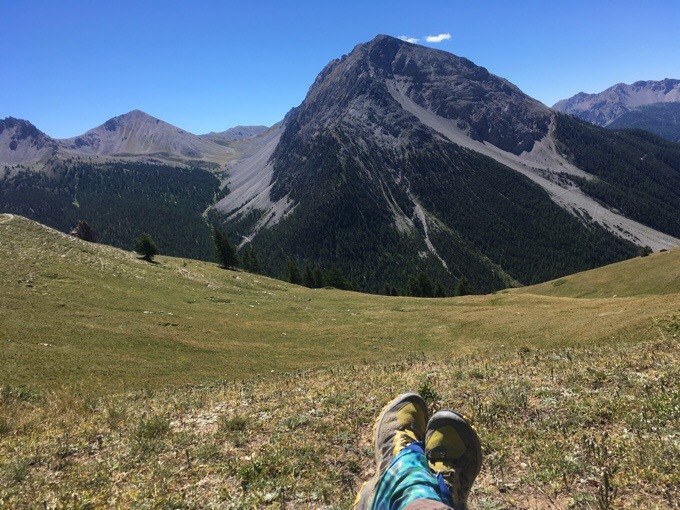 Lunchtime view at Col de Pertusa. After lunch, I headed downhill to reconnect with the GR5. I will mention that there is water on the GR5B variant that isn’t mentioned in the guidebook. 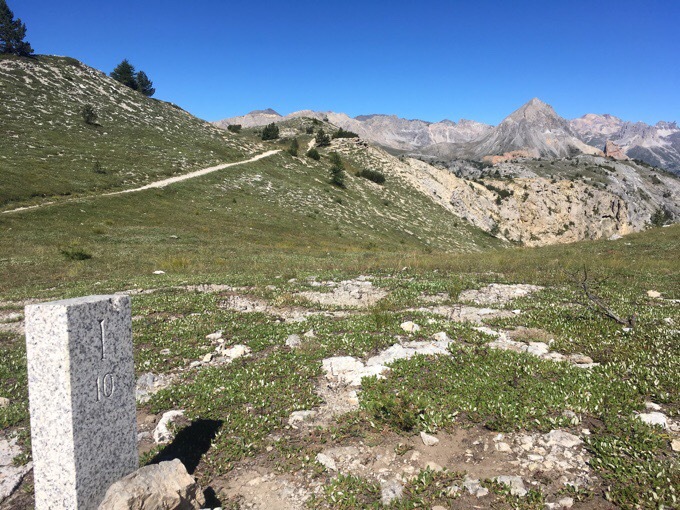 It’s an obvious stream and fountain next to the trail as it switchbacks below some old buildings just after Col de Pertusa. 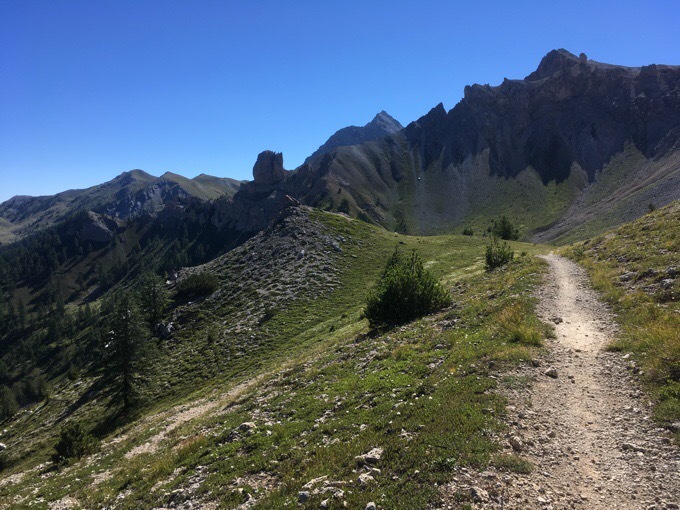 Once back on the GR5 and though the wooded drop in a valley, I had two cols to go over (Col de Dormillouse and Col de la Lauze) that took a couple hours. Going up Col de Dormillouse. I didn’t see anyone until I got over both cols. Views were expansive and quite nice. 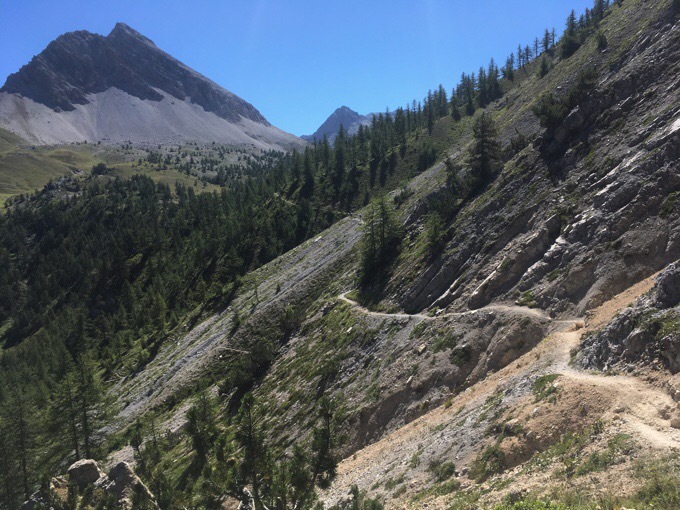 Going down Col de la Lauze. 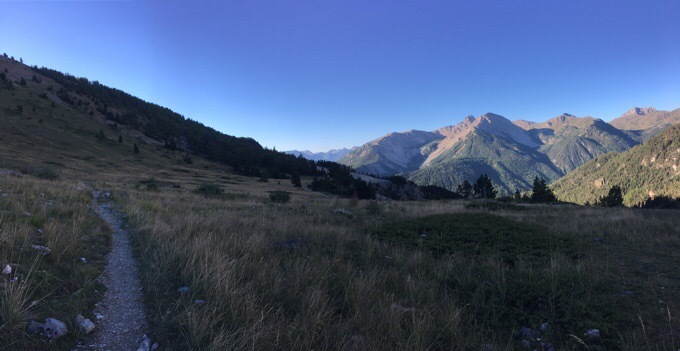 Tomorrow, my plan is to hike into Briançon in the morning and get a nice relaxed nero. 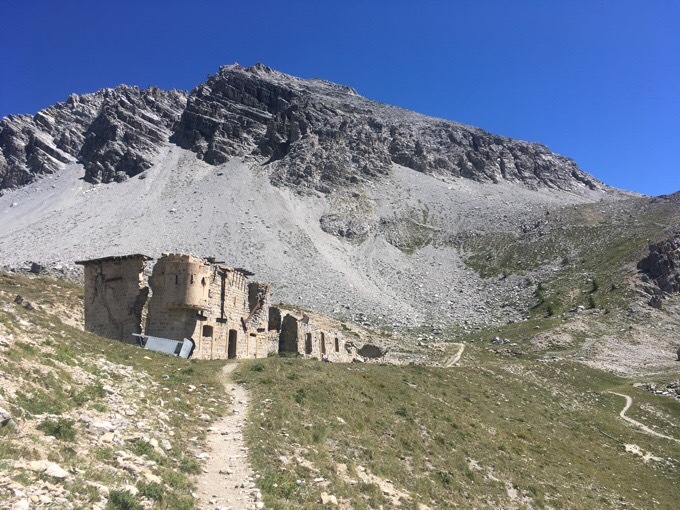 I got a bit further than expected today and found myself approaching the town of Montgenèvre before 5pm. 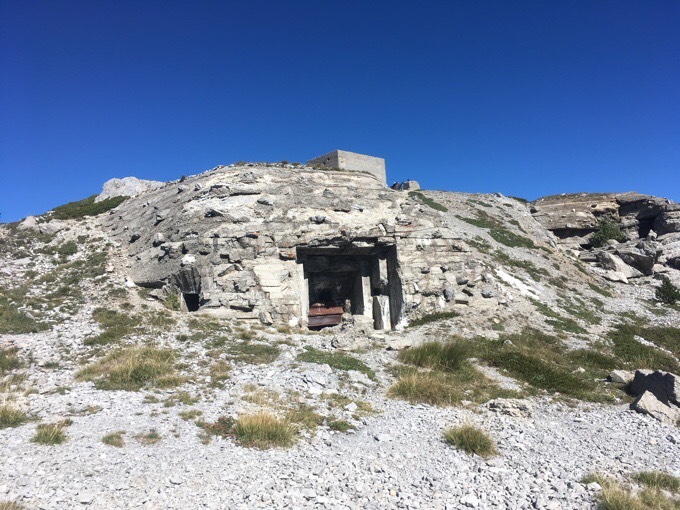 I didn’t want to get too close to the next town of Briançon, and it seemed there may not be an ideal spot to stealth camp between the two. 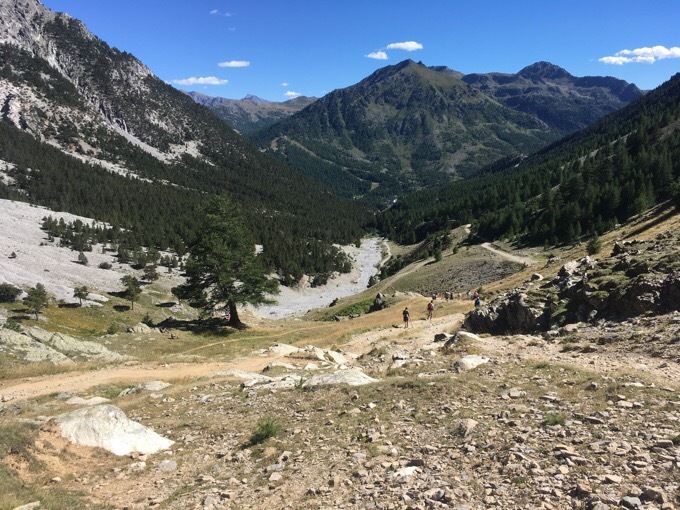 I grabbed water from a stream and walked up into the forested area along the track to Montgenèvre. It was just before 5pm, but I think it really was one of the last options if if I didn’t want to get stuck having to hike another hour or more. I also had service! Today was the big solar eclipse everyone was waiting to watch back home. It almost goes pretty close to my current home of Portland, OR, but the best place in the whole country to watch was where I was raised in my hometown of Carbondale, IL. Pretty cool! I was happy to be on social media seeing everyone post and I even got to watch the CNN live feed a bit. 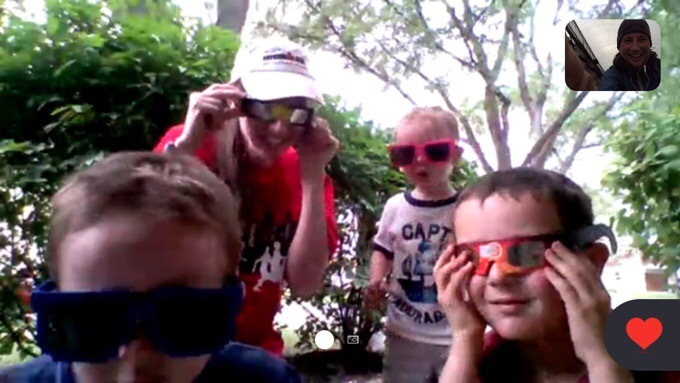 The best part was that I got to Skype with my sister and nephews. So dang cute! 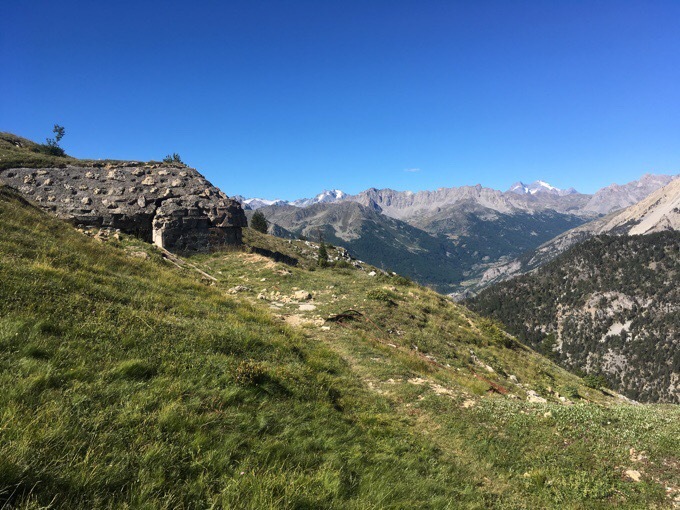 I’ll explain Briançon more tomorrow, but I’m looking forward to spending time there. I am really wanting my own space, so I got a great deal of just $54/€48 total for an Air BnB that will let me check in tomorrow morning, has an actual washer for my clothes, has a (French) breakfast with homemade jam, wifi, and provides a comfy big bed with sheets, towels, and soap. These things have been difficult to find in the gites, and this price beats everything else I’d seen available for a whole lot less. Looking forward to this one! I’m up way too late tonight with all this eclipse stuff, and I’m not even in the US! The eclipse was a pretty spectacular event. We watched it from Crooked RiverRanch where we evacuated to because of a Forest Fire near our Sisters, Or. home. Couldn’t have found a better place to view the eclipse. 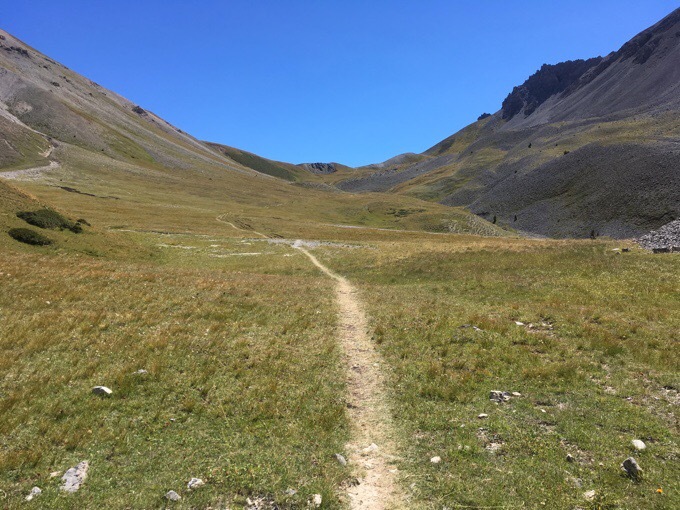 Great pictures of your continued hike – such a different area and so many others sharing the trails with you!! I like the looks of your trails today. Looks fun. Erin, I just binge read your entire blog. I found it around mid-april this year. You have come quite far with your writing, it was been very enjoyable to ‘hike’ and grow along-side of you (the increased amount of pictures is greatly appreciated)! I must let you know that you have inspired me. I am not much younger than you and grew up camping and backpacking, but haven’t done it since I was as teenager, for various reasons. Until now. THANK YOU! I can’t believe how much better it makes me feel, and reminds me of how much I love the outdoors. Now you’re caught up with real time! You got through it fast! So glad I can spread the wanderlust. Thanks for saying hi! Enjoy the journey out there! I did take the same great route, but I had to return to the US at Briacon. I thought you might like to know that you get a paragraph in the latest Bibbulmun Track Foundation News, in the E2E “Yes, they did it” section! Like my name is on a list or an actual paragraph I wrote? Email me a photo of it if you can please? A proper write-up. Just emailed it to you, hope it arrives OK.
Great pics and fantastic views. 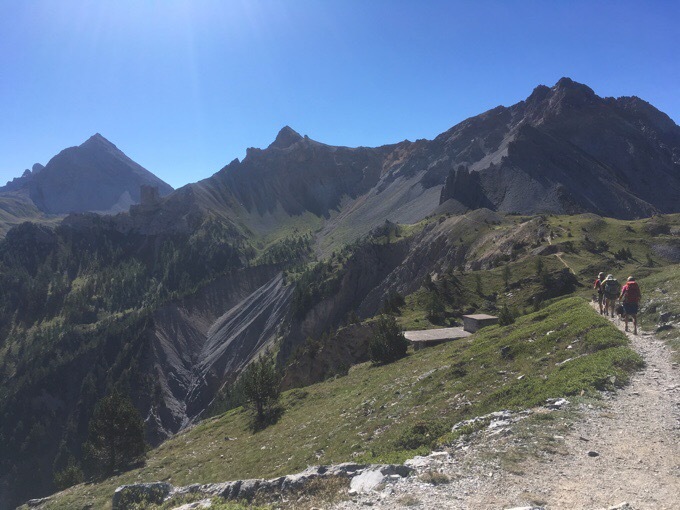 You’re having a fantastic run with the weather, it would be such a shame to hike such a beautiful area and not see the views. Hope it keep clear for you. Loved the trail today .. both the trail itself, and the inter sting, if creepy, bunkers! Yes, it was eclipse day on Monday. Spectacular, here in Central Oregon! Did your nephews have a clear view? Yes, it was not 100% coverage near Chicago, but they got to see it. Another “perfect” day! I was at Mica Lake for the 90% eclipse in the North Cascades. I took a 4-hour break for the eclipse and didn’t even crack 10 miles that day! Ha! Had to hike 23 the next day to make up for it. Totally worth it I bet!